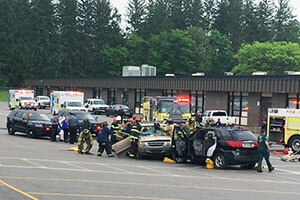 “The Mock Crash held at Warwick Valley High School on Tuesday, May 22 was not meant to be an easy way for students to skip a period or two. Instead, it was meant to show students of all ages that their decisions matter more than they think. 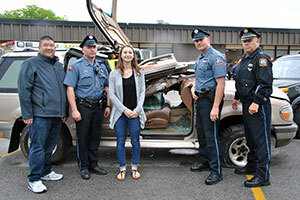 Making safe choices when driving can be the difference between life and death – which we hope is illustrated through the Warwick Valley Mock Crash. The Mock Crash only occurs once every three years, so for most students it was the first time they experience a crash on this scale. We hope that the impact of the crash stays with students for those three years and beyond. We want to show students, through a realistic project, that one bad choice can negatively impact their lives forever. The Mock Crash would not be possible without the help of our local Fire Department, Police Department and EMTs. They made this event possible, and cannot be thanked enough. S.A.D.D. has been a part of Warwick Valley High School for many years and, after taking a short hiatus, was revived in 2016. Members strive to educate students about making good choices, and have participated in events such as Red Ribbon Week and “near peer” mentoring, and have gone to the Middle School to help teach middle schoolers how to make smart decisions. 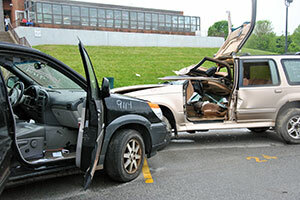 A longtime district event, the Mock Crash is intended to teach important lessons. 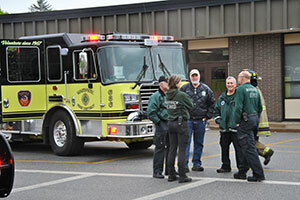 WVHS students observed the event, held in the parking lot between the High School and the Middle School, though there was an opt-out option for students who were not comfortable watching the crash. Warwick Police Officer/WVHS SRO Michael Kearns and members of the Warwick Police Department, Warwick Fire Department and Warwick EMS all played important roles in the success of the event. S.A.D.D. 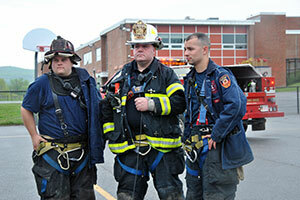 students and high school faculty members participated in the event as actors. 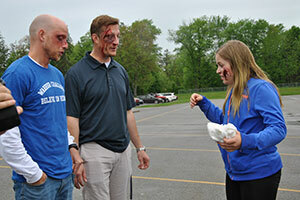 Realistic makeup for students who portrayed injured teens was provided by students in the HS CTE Cosmetology program. 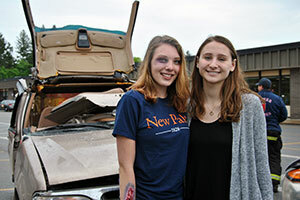 It was a staged “mock” crash, but students who watched and participated in the event said the experience felt very real – and so was the message about making smart choices. Students Against Destructive Decisions (S.A.D.D.) empowers young people to successfully confront the risks and pressures that challenge them in their daily lives. The group creates, equips and sustains a network of students focused on peer-to-peer education. It also fosters a sense of belonging and promotes resiliency, leadership, and advocacy skills. S.A.D.D. encourages youth to make positive life decisions.